Mikey’s (Sean Astin) parents are risking having their house foreclosed, which will force them to move out of the region and Mikey will then lose touch with all of his friends. In an effort to save the home he and his four friends find a treasure map in the attic and they decide to follow it. On the way they bump into the infamous Fratelli family who compete with the boys for the treasure as well as threatening to kill them. The concept is great and full of the type of grand adventure any 10-year-old boy dreams about. The action is generally entertaining and moves at a rapid-fire pace, which at times borders on becoming dizzying. However, the whole thing becomes increasingly more fabricated and fairy tale-like and inserting some subtly and restrained would have helped create a better balance. The comedy is actually quite funny most of the way and I really enjoyed the opening car chase and wished that it had been strung out a little bit more. It does though become a bit too slick for its own good. Any peril the characters find themselves in immediately gets resolved in some cutesy way and thus there is never any type of real tension. The special effects are not on par with what you might expect from a Steven Spielberg production. The big boulders that come crashing down around them look very much like the ceramic creations that they are. The bats that fly out at them also look unrealistic, but I will give credit for the pirate ship. There are also all sorts of gadgets and booby traps that the kids run into that was supposedly built in 1632 by the pirates, but I found it hard to believe after 300 plus years that stuff would still be functioning. 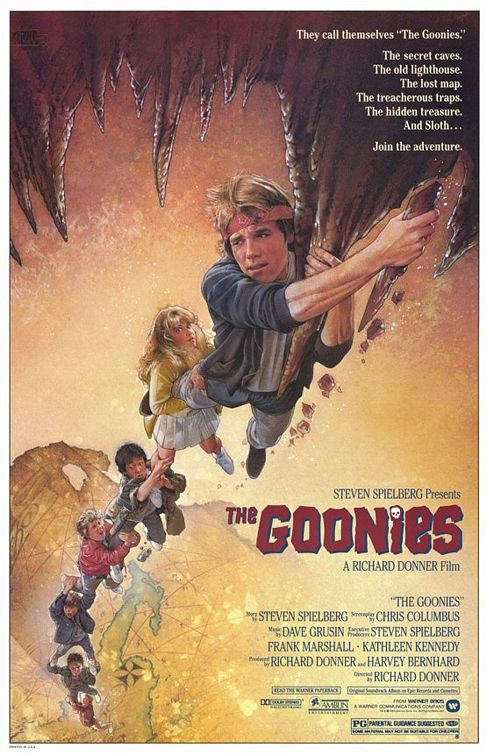 The young cast is okay, but it is asking too much that these kids carry the picture and it would have been better had some veteran actor been cast as an adult who goes along with them in order to give the thing a little more stature. Astin though gives a good effort in the lead and at certain angles looks exactly like his famous mother Patty Duke although I could have done without his strained ‘our time’ speech. Corey Feldman is also quite engaging especially at the beginning when he translates things for Mikey’s Spanish speaking maid (Lupe Ontiveros). I wasn’t so crazy about Jeff Cohen who plays the fat kid named Chunk as there are just too many fat stereotypes with the character. The jokes involving his propensity for food are clichéd and tiring although his puke story does earn him a few points. I thought it was good that actresses Martha Plimpton and Kerri Green join the boys later on by playing older teenage girls. Green’s character may be a bit too much on the prissy side and the fact that she could have romance on her mind as they are trapped in a dark and dangerous cave seemed almost absurd, but Plimpton is solid. Anne Ramsey is terrific as the villainous mother of the two bad guys (Robert Davi, Joe Pantoliano). In many ways I thought she was more engaging here than in her most famous role in Throw Momma from the Train. The film is a bit too good natured and at times becomes like a live-action kiddie cartoon. I also thought Cyndi Lauper was a terrible choice for the soundtrack, but despite all that I still found it to be fun and perfect non-think escapism. This entry was posted in 80's Movies, Action/Adventure, Campy Comedy and tagged Anne Ramsey, Corey Feldman, Entertainment, Jeff Cohen, Kerri Green, Martha Plimpton, Movies, Review, Sean Astin, Steven Spielberg. Bookmark the permalink. 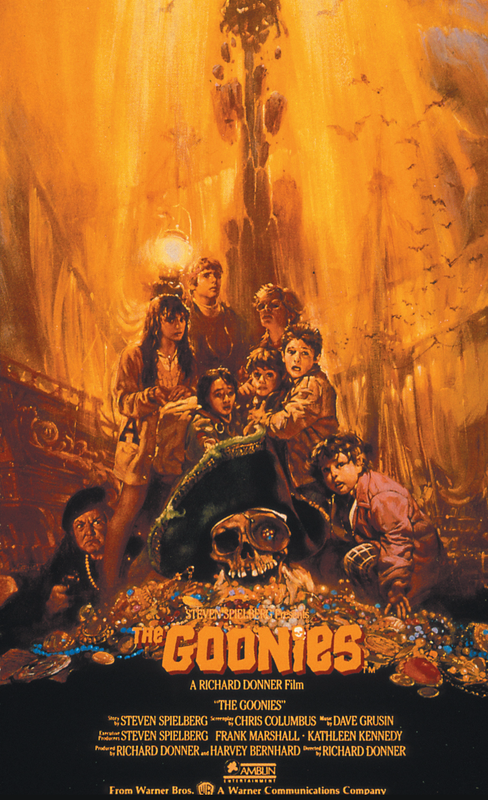 LOVE the Goonies! There are a lot of movies I liked as a kid that, when I watch again as an adult, I find pretty lame. But this one isn’t one of them. Definite cult-classic. Glad to see a good rating from you! Strangely enough when I first saw this when it came out in the theaters I didn’t like it. I thought it was too fast paced and over-the-top, but now I found it enjoyable. I suppose because of the nostalgic factor, which can surprisingly go a long way. Fantastic review of a cult film, like the four word summary too!